The Thunder .380 controls are all in the "right" places. All are handy and easy to acquire. This job is full of surprises. One of them popped up this week when we wrapped our hands around a new little .380 semi auto for a couple days of shooting. 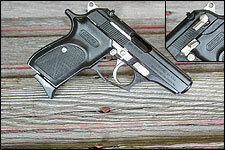 It's called the Thunder .380 and it's produced in Argentina by Bersa S.A. This little rig generates a lot of bang for the buck. The Thunder .380 is a small arm, measuring but 6.6 inches overall. It weighs 20 ounces and is just over an inch and a quarter wide. It's available in two finishes--the attractive matte black of the sample as well as a satin nickel. The little Bersa sports a dual-action trigger that allows the first shot from a magazine to be delivered double-action with the subsequent shots going single-action. The pistol features an exposed hammer that allows the hammer to be manually cocked, moving the arm into single action, instantly. Out of the box the trigger isn't bad. The single-action pull is around six pounds or so with little takeup and just a bit of creep. It's good enough to allow some respectable shooting. The double action pull, likewise isn't bad-probably about double the single action pull--but smooth and linear just the same. Operationally, the little Bersa has everything in the "right" places. The safety is located on the left side of the slide and it acts as a de-cocking lever when it's fully depressed. The safety engages the firing pin when activated, as well. The pistol also features a magazine disconnector or safety as well, unfortunately. While we understand the motivation for these things, we prefer a firearm that acts like a firearm, should the magazine be unavailable for some reason. Weighing but 20 ounces it doesn't make much of a club. The arm is shipped with one seven-round magazine. Additional magazines are available for a MSRP of $33.95 and Bersa also offers a Thunder 380 Plus, 9 round magazine for $47.95. The magazine release is located on the left side of the receiver, behind the pivot point of the trigger. Depressing the release nicely ejects the empty magazine. The slide release is immediately above the magazine--again on the left side of the receiver--and it is activated when the last round from the magazine is fired. Typical of arms based on this simple design, the Bersa is a snap to field strip. After verifying that the arm is empty and dropping the magazine, one simply rotates the takedown lever (right side of the receiver) downward and then pulls the slide back and upward. The recoil spring is coiled around the barrel and remains there during the disassembly process. It takes about two seconds to field strip the Bersa and about the same amount of time to put it back together. The Thunder .380 sports good sights with one white dot up front and a pair of white dots at the back. The rear sight is adjustable for windage but elevation is fixed. Out of the box, the rig was in the black at 10 yards. Because the Bersa and similar arms aren't designed as long range target rigs and most confrontations occur at the proverbial 7-10 yards, we elected to run this arm indoors at 10 yards for the entire session. The fact that it was near zero outside also had a slight impact on our decision! At any rate, our ammo locker was getting low where the .380 is concerned, but we managed to come up with five loads that tend to mirror most of the ammo that is out there. We rested the arm on sandbags and again used our competitive shooting glasses to clear up the front sight. Throughout the limited range session, the Bersa didn't miss a beat. When things quieted down, the little .380 averaged just over an inch and a quarter with all five loads, generating around 150 ft/lbs of instrumental energy, 15 feet from the muzzle. The exception to this rule consists of Cor-Bon's great 90-grain +P load that leaves even this stubby barrel doing five fps shy of 1,000 fps, producing very nearly 200 ft/lbs of energy in the process. This load would be a natural choice for serious social work. Because our ammo was limited, we managed only to run 125 rounds or so through the Bersa--not a torture test to be sure. Still, the Thunder .380 gave no indication that it would perform differently after a thousand rounds, either. Selling for less than $250--or about half the price of some of the competition--the Bersa Thunder .380 looks like a bargain any way you cut it. Clone or not, this one's a winner.